A new version of GeeXLab is available. 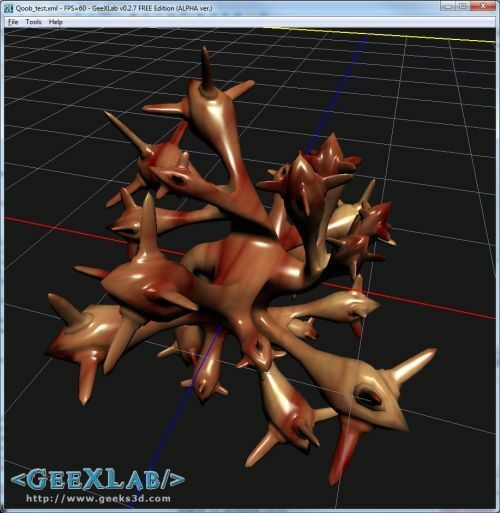 GeeXLab 0.2.7 adds the support of Qoob mesh format. What is Qoob? Qoob is a tiny modelling tool for demomakers. See this post for more details about Qoob. Qoob has been created by Auld from Titan. Thanks to Qoob you can model very cool meshes like the one at the top of this post. Other new thing in GeeXLab 0.2.7, is the support of Python 3.2. The Python version of GeeXLab comes now with three DLLs: GeeXLabCore.dll (Python 2.6 + Lua, this is the default DLL), GeeXLabCore_Py27.dll (Python 2.7 + Lua) and GeeXLabCore_Py32.dll (Python 3.2 + Lua). By default, Python 2.6 is used. If you want to use Python 2.7 or 3.2, just rename the corresponding DLL in GeeXLabCore.dll. New: added LoadQoobObject() to HYP_Mesh (Python and Lua). New: added Python 3.2 support. BitmapFontRender3DUnicode() and BitmapFontRender2DUnicode() to HYP_Utils (Python, Lua). New: added SetTextUnicode() to HYP_FontOutline lib (Python, Lua). New: added Font2DRenderUnicode() to HYP_Renderer lib (Python, Lua). Bugfix: in AntTweakBar when multitextured objects are rendered before. Very nice and I’m ashamed to say the first images coming out of GeeXLab are better than I have hand coded so far with qoob.